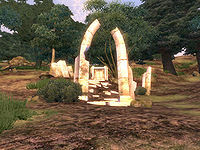 Arpenia is a small Ayleid ruin between Bravil and Leyawiin containing animals (quest-related). It contains only one zone, Arpenia. This cave can be entered, fully explored and all items retrieved without starting the related quest. If you do have the quest active, once you reach the marker at M, a quest update will be triggered. 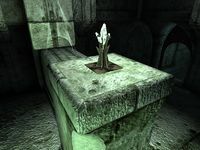 This seemingly uninteresting ruin presents one curious feature: some rooms are illuminated by peculiar white crystals, set on the pedestals which usually hold Welkynd Stones. 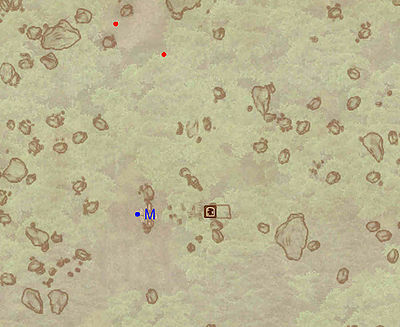 This location's map marker (M on map) is named Arpenia (editor name ArpeniaMapMarker). The entrance door is E of the marker, 70 feet away. Arpenia, while large, is fairly unpopulated. The enemies present are the standard nuisance animals, and the only real danger is therefore posed by the multitude of traps that dot the ruin. Your first taste of what's to come is the Ceiling Spikes trap (C) in the second large room you enter. 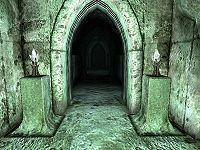 In the center of the third large room are an Ayleid Cask and a Dark Welkynd Stone (D). Use the walls to protect yourself and dash for the chest when the trap is recharging. Opening the Hidden Door at H by standing on the pressure plate in from of it (cyan dot on map), will give you access to a minor loot chest. 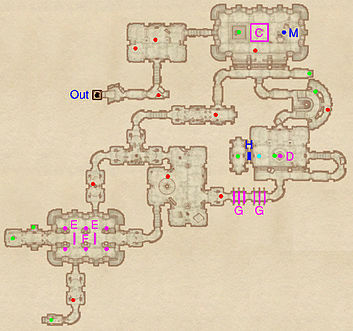 After going through two sets of Swinging Blade traps (G), you will arrive at a room with an intersection. Take the southwest exit and brave two Falling Blade traps (E) to gain access to two minor loot chests. Jump down in the room below, taking care to avoid the six Gas Traps (F). Explore the southern passage and then locate the northern corridor. 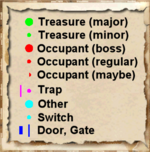 Take a left at the intersection and follow the corridor to a minor loot chest and easy access to the second room from the balcony. Marker that triggers quest update at location M on map. You must approach within 200 feet of this marker for the Azani Blackheart quest to advance.